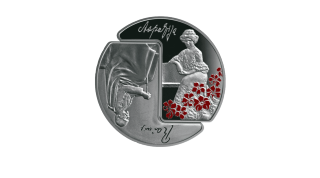 In honor of the 150th birthday of Latvian poets Rainis and Aspazija, on September 8 the Bank of Latvia released a silver collector’s coin to celebrate. The coin, in two detachable parts, features facsimile’s of poetry by Rainis and Aspazija as well as their portraits. The proof quality coin, with a face value of 5 Euro, has a mintage of 7000 and was minted by UAB Lietuvos monetu kalykla (Lithuania). Arta Ozola-Jaunarāja provided the graphic design and Ligita Franckeviča the plaster model.